​When Zentangle appeared to​ us in late 2003, we knew immediately that it was important. When we started telling people about it, they thought we were perhaps working too hard, or starting to lose a bit of our minds, but we kept right on spreading our story. I knew the importance and comfort of creating, and Rick. . . well he usually knows everything, but he especially knew the impact of the relaxed focus of meditation. But how could we have foreseen the directions that Zentangle has taken all of us. I personally feel more confident, extremely content and open to new possibilities, besides for a bunch of other changes in my life. Recently, we received the most beautiful and fascinating letter. It is from one of our Certified Zentangle Teachers (CZT 16). I remembered Linda, and was happy to hear from her. We asked her if it was OK to share her story with all of you, and she graciously said yes. 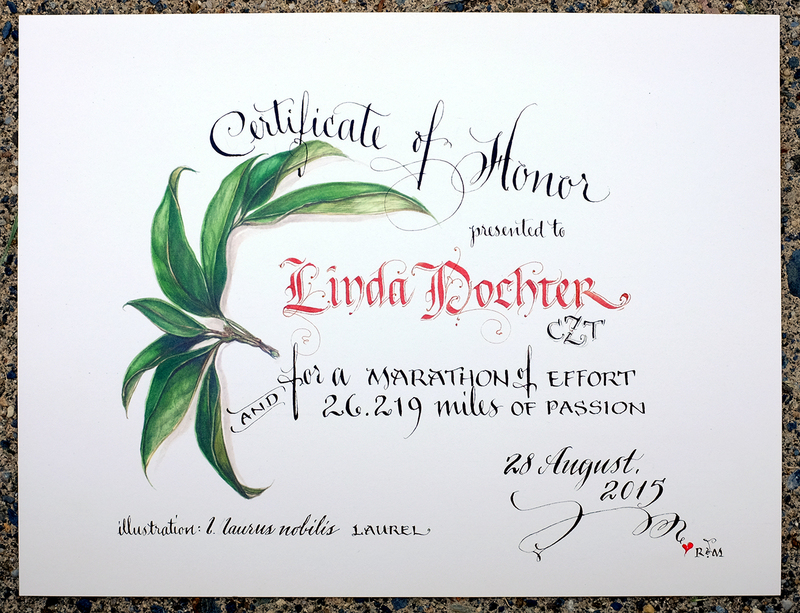 Our gratitude to Linda and All of You who take the time and effort to tell us your heartwarming and moving stories. Here is Linda's letter in its entirety. Hello. 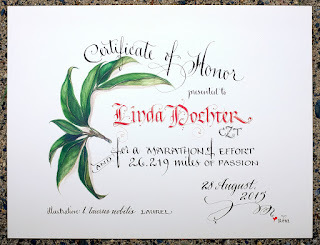 I’m Linda Dochter from CZT® “Sweet 16.” Friends call me “Doc.” Back around the time I was in Providence, I was in the habit of walking several miles around my neighborhood a couple times a week (unless there was a convenient excuse not to walk). Too rainy, too cold, too tired, too hot, too busy, too lazy, too boring, too this, too that. Then I had an unfortunate trauma accident that left me with a broken back – one that required extensive surgery and landed me in a brace and a wheelchair in a rehab hospital for awhile. In rehab, physical therapists worked with me daily to get me back to walking again. After a period of working on strengthening and balance exercises, PT Jim took me into an unobstructed hallway outside of the gym and gave me a walker. My assignment: To walk as far as I could with the walker with Jim following with the wheelchair. When I reached my limit, I could sit down in the wheelchair. As I collapsed into the wheelchair, Jim asked, “How do you feel?” “Like I just ran a marathon,” I responded. PT Jim measured the distance I had covered as 30 feet – about the distance to walk around a car with a walker and some difficulty. PT Jim recorded a note on my chart. The next day, PT Jim and I ended the therapy session in the gym back in the same hallway with the same walking assignment. Again Jim asked, “How do you feel?” “I’m training for a marathon,” I responded. PT Jim measured the new distance as 43 feet. I had made it around a slightly bigger car, again with a walker and with difficulty. “A new personal best,” I declared. Again, Jim took notes. Then the germ of an idea sprouted. This really was like training for a marathon. Had I not been encouraging others in my fledgling Zentangle® business– “Anything is possible – One stroke at a time™.” Could one pen stroke represent one step? Put one foot in front of the other. Cover a short distance. Record the result. Put one foot in front of the other. Set a new personal best. Record the result. Just keep putting one foot in front on the other . . . Make forward progress. . . . One step at a time. Yeah. Anything is possible, one stroke at a time . . . Anything is possible, one step at a time. Days later, I set a goal to walk a real marathon (26.219 miles). Not in one shot, mind you, but by counting all the bits and pieces of PT exercises, walking to and from PT sessions, walking here and there around the rehab hospital. I recorded any distance where I put one foot in front of the other and made forward progress. The rehab therapists cheered me on every day. On an occasional afternoon, I held basic Zentangle classes for other patients from those who need occupational therapy for hand dexterity to individuals who were confined to bed with nothing else to do except watch daytime TV. My only teaching resources were an Apprentice Classroom Pack and a burning desire to encourage the discouraged to keep on trying – just one stroke at a time. Some ambulatory patients just came to watch the class. Since everyone in class was in a wheelchair, the mosaic became a “passing of the tiles” so everyone could appreciate the work of others. The change in the attitudes of my students and the onlookers from the start to the end of a session was palpable. Four weeks after setting the goal to walk a marathon, I returned home from rehab and continued working with physical therapists in an outpatient program. I had almost completed the first mile of my goal. August 28, 2015 marked the day when I returned to the gym in the rehab hospital to cross the ceremonial finish line of my marathon. Elasped time: 66 days. I was cheered on by the physical therapists that had cheered for me at the start. They told me that tiles left behind from the occupational therapy classes are still on display in the community lounge. Now I walk because I’m grateful to be able to walk, armed with a story that “Anything is possible – One stroke at a time” as I make my way into the earlier_than_ expected retirement phase of my life . The Zentangle Method and occasional teaching assignments will surely be a part of my plan. Thank you to all who joined us on our revisit to the Victoria & Albert Museum in London, England. It was such a grand trip, if you have not read this blog post, please don't miss it! We chose three names (at random) as so many of you made such great comments on the subject of tangle hunting in museums and other wonderful thoughts. Please send us your snail mail address so we can send you a gift from us.